WELCOME TO STEVE'S STAR TREK HOME PAGE! DAYS UNTIL THE PREMIER OF STAR TREK: NEMESIS! ENTERPRISE INFO PAGE The Helling Family Photo Album (UPDATED JUNE 2, 2002!) 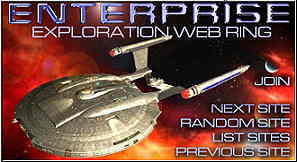 The Next Generation Info Page Deep Space Nine Info Page Voyager Info Page NEMESIS INFO PAGE Federation Star Ships Memorable Characters Memorable Characters II Star Trek Links In Memoriam STEVE'S STAR TREK RECREATION CENTER Thomas Reese Helling Star Trek News! Click to subscribe to ST Enterprise Pics and Info Star Trek is a registered trademark of Paramount Pictures. All Star Trek images, marks and copyrights are property of Paramount Pictures. All Rights Reserved.